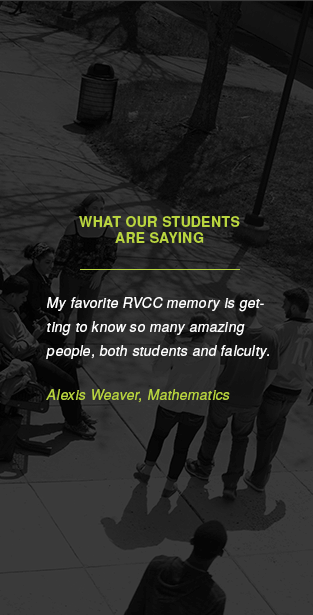 For some, mastering the basic concepts of mathematics required of all College graduates can be a challenge. For others, mathematics is a rigorous and stimulating intellectual exercise that tests analytical skills and can lead to great discoveries and innovation. Our dedicated and supportive faculty members are committed to providing you with the highest quality of instruction, regardless of your ability or career goals. The Mathematics Department offers classes to fulfill mathematics requirements for all degree and certificate programs offered at the College. We also offer developmental mathematics courses for anyone who needs assistance in improving basic mathematics skills in order to successfully progress into a chosen major. Our math majors have continued their education at such prestigious colleges and universities as Cornell University, Harvard University, The College of New Jersey, New Jersey Institute of Technology (NJIT), Stevens Institute of Technology and Rutgers University College of Engineering and School of Business. No matter what your skill level, the Mathematics Department is here to help you master your skills and build the foundation for success in college and beyond. 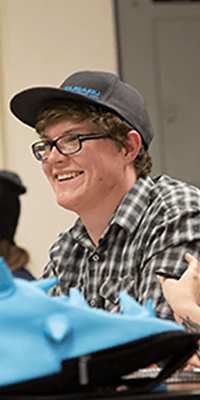 The Department offers opportunities for students of all abilities and majors, starting with review classes boosting basic math skills, through the calculus sequence and beyond. We even have honors level mathematic courses. 4. B. Bendjilali “On the Instability of the Edge worth Process" Journal of Mathematical Analysis and Applications, Vol. 169, No. 1, September 1992, U.S.A.
8. B. Bendjilali “On the Stability of a Retarded Functional Differential Equation Edge worth Process" Journal of Applicable Analysis Vol. 36, February 1990, U.S.A. Awards, Research & Grants: Leadership Award in Computer Science, May 2001. M. D. Wagh and Khadidja Bendjilali, "Algebraic Models for the Cube Connected Cycles and Shuffle Exchange Graphs", Proc. of IEEE Int. Conf. on High Performance Computing and Communications, pp. 51--57, Sept 2-4, Banff, AL, Canada, 2011. M. D. Wagh and Khadidja Bendjilali, "Conquering Edge Faults in Butterfly with Automorphisms", Proc. of Int. Conf. on Theoretical and Mathematical Foundations of Comp. Sc., pp. 57--64, July 12-14, Orlando,FL, 2010. M. D. Wagh and Khadidja Bendjilali, "Butterfly Automorphisms and Edge Faults", Proc. of Int. Symp. on Parallel and Distributed Computing, pp. 33--40, July 7-9, Istanbul, Turkey, 2010. Publications: A software for the shear design of rectangular reinforced concrete beams, presented at the American Society for Engineering Education Mid Atlantic Section Annual Meeting, April 07 at Newark, NJ,(Using Visual Basic programming language). A computer program for Analysis and Design of Wide Flange columns using ASD and LRFD Design criteria, presented at the American Society for Engineering Education North Central Section Annual Meeting, April 99 at Erie, PA,(Using Visual Basic programming language). Inflation in Construction as a Bidding Factor, presented at the annual conference of the Associated Schools of Construction in April 96 at Atlantic City, N.J. (Using C++ programming language). Practical computer software for the Matrix Effectiveness Review Technique which is used as a tool for Construction Management, presented at the annual conference of the Associated Schools of Construction in April 95 at Atlantic City, N.J. (Using C++ programming language). Awards: “In Grateful Appreciation of Multi-Year Dedicated Service to GSUMC” by MAA-NJ/GSUMG Directors; “Certificate in recognition of 5 Years of dedicated service” by the RVCC College President. Publications: 15 scientific papers and 2 textbooks. Recent Researches: I conduct a study of dynamic interrelationship among personality, motivation, emotions and cognition in application to multimedia mathematics teaching. I presented my researches on “Method and System to Manage Cognitive Load in Online Mathematics Courses” at the International Journal of Arts and Sciences' (IJAS) Conference at Harvard University. My paper on "Adaptive Multimedia System for Online Mathematics Courses: Cognitive Approach" had been published in the International Journal of Arts & Sciences. Also I presented on “Method of Presentation of Educational Information for Distance Learning, Online, Hybrid and Tele-courses” at the 3rd International Multi-Conference on Society, Cybernetics and Informatics (IMSCI). The abstract had been published in IMSCI Proceedings. Currently I am working on application of iPad and iPhone to interactive math education. M.S., Industrial Mathematics, Aston University U.K. Languages: CGI/PERL, TCL, PHP, Python, SQL, PowerBasic, Assembler, C, Pascal, Java, etc. Siham Alfred Math Award honors the graduating mathematics major earning the highest GPA in the major while demonstrating commitment to the RVCC community. Vince Bodino Math Achievement Award honors the graduating mathematics, computer science or engineering major who started in a developmental math course and ended excelling in calculus. Career Coach – Learn more about career opportunities in mathematics. Enhance your passion for mathematics by joining the Math Club.